Download or stream it on Apple Music, iTunes, Google Play, Amazon, Spotify, and other services. This is just the beginning. 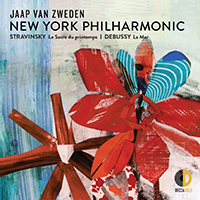 Decca Gold will release six additional recordings in the 2018–19 season featuring Jaap van Zweden and the Philharmonic. How will Alan Gilbert be celebrating his birthday Monday night? As co-host for WQXR’s Carnegie Hall Live broadcast of that evening’s performance of three Beethoven Piano Concertos by the Mahler Chamber Orchestra with his friend Leif Ove Andsnes as soloist. The pianist will lead Beethoven’s Second, Third, and Fourth Piano Concertos from the keyboard, as Alan and WQXR host Jeff Spurgeon discuss Leif Ove’s extended musical adventure through the five piano concertos he has called “The Beethoven Journey” — what it means to dive into the great composer’s work so thoroughly, and his discovery of how and why audiences connect with this music. Grab a slice of birthday cake and tune in to WQXR at 8:00 p.m. on February 23, 2015. This Saturday, come in from the cold and enjoy the Young People's Concert with the young people in your life. Titled Super Sonic Music Box: “Orchestra Transformed,” the concert features the Silk Road Ensemble, who, with the Philharmonic, will celebrate influences and instruments from different cultures. You'll hear a gaita, a Galician (Spain) bagpipe instrument, and a suona, a Chinese wind instrument, and works by composers ranging from Mozart to Kojiro Umezaki and Sapo Perapaskero. We invite you to bring an old winter coat or other gently used clothes and drop them in one of the bins around Avery Fisher Hall. Volunteers from UNIQLO, which sponsors this season's Young People's Concerts and is dressing the Orchestra for them, will distribute them at New York City Homeless Shelters. The concert's at 2:00 p.m., but be sure to come at 1:00 for YPC Overtures, a mix of fun musical activities throughout the hall. Follow the first link above for info, a podcast, and TuneUp educational program notes. Pianist Jeremy Denk has talked about the "weirdness" in great music. Yesterday morning in the Green Room, we asked him for examples in Beethoven's Piano Concerto No. 1, with which he makes his debut with us this week. He played some "moments of harmonic slippage ... these magical 'purple patches' or senses of instability..."
The audio streaming site Rhapsody named the April 14 release of music by Beethoven and Gershwin to its Top 10 Classical Albums, April 2014 list. The release is part of Alan Gilbert and the New York Philharmonic: 2013–14 series, which contains 10 releases for download and streaming. The Gershwin piece on the release is An American in Paris, which Alan will conduct April 22 (sold out, but check for turnbacks).